In this article you’ll learn how to configure VMware High Availability (HA) cluster. It’s not in depth article about HA, but gives you enough knowledge and get things running. You could already read my article VMware HA cluster – how it works with an introductory video from VMware TechPub. VMware HA components changed in vSphere 5 where the AAM agent (automated availability manager) responsible for the communication between hosts present in the cluster and vCenter, has been replaced by FDM (Fault Domain Manager). I written also a detailed article about FDM here: vSphere 5 – New High Availability Agent Introduced – FDM. VMware vSphere High Availability (HA) is composed from three main components, which each of them plays different role. FDM – Fault Domain Manager is responsible for communication between hosts which are part of the cluster, informing other members about available resource, and VMs state. FDM manages the restart of VMs in case host fails. vCenter Server – is used to deploy and configure FDM agents inside the cluster. Manages the election of server elected master. If the whole vCenter server (or just the service) fails, the HA still continues to work. Basic two hosts HA cluster running in my lab. To be able to create cluster with ESXi hosts, a vCenter is needed. The most basic package, vSphere Essentials cannot be used since the limited licensing does not allow you to create HA cluster as only vSphere Essentials Plus allows you to do that. The essentials package basicaly allows you manage three hosts from central location which is – vCenter server for essentials. vSphere Replication (VR) can replicate VMs to another host for DR scenarios – supports VSS) . Essentials Plus is an entry level package for small business which needs to consolidate (virtualize) like 20-30 physical servers, and make the VMs be high available. Any hardware failure of the physical hosts enables the automatic restart of VMs on another host in the cluster. vSphere Essentials Plus or higher. Shared Storage – you’ll need some kind of shared storage. I say some kind, since you can use dedicated storage device (NAS, SAN) or also you can use other (software based) products which emulate the shared storage, like VMware VSAN, or any NAS or SAN hardware device. CPU compatibility between the hosts – the ideal cluster is a cluster with exactly same hardware and memory size. Small 3 host cluster allowing to run 20-30 VMs will satisfy most of SMBs. 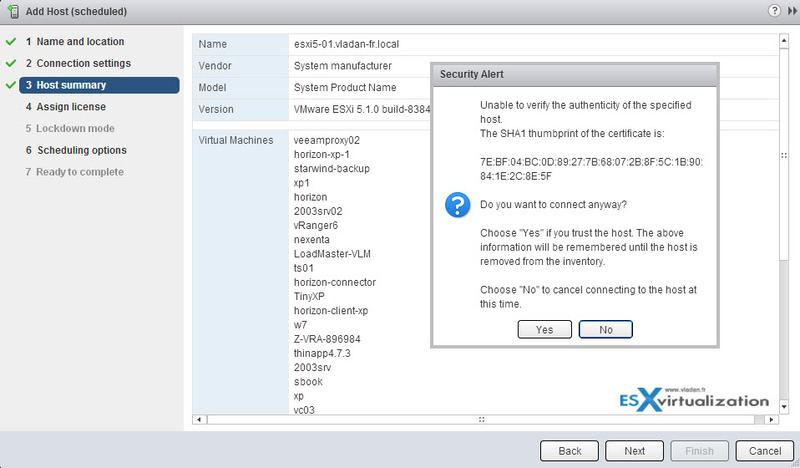 But you can use VMware EVC to adjust cluster settings for CPU compatibility. The vCSA has the advantage that its all-in-one prepackaged product, part of the bundle, and so no need to install the individual components one by one. Another requirement for creating VMware HA cluster is solid DNS architecture with forward and reverse zones created and working. If not already done, create on your DNS server the necessary records now. Let’s create datacenter and cluster now. Once done, you should see new icon appear. I called my Datacenter vladan. -:). Then again, right click the datacenter you just create and create new cluster. While going through the assistant you’re asked, if you want to Turn On DRS and Turn On HA. If you’re on the Essentials Plus licensing, you’ll get a pop-up saying that Essentials Plus isnt’s available, or something like this. As the DRS is available only in Enterprise and Enterprise Plus. If you don’t want to activate those options now, you can leave unchecked, and continue the assistant. You can do exactly the same steps by using the vSphere Windows Client, as a configuration of VMware vSphere (HA) cluster is still the base element of VMware, and the new vSphere Web Client only brings new functions like vSphere Enhanced vMotion or deployment and management of vSphere Replication. You’re prompted for a root password on that host. The last point is to attach a license. In my case, the license has already been entered in vCenter server, so I can assign that license to that host. When you first installing your hosts and vCenter server, you have 60 days for entering your license, and here through this assistant you wan use the Evaluation Mode license. But after 60 days, the VMs will get disconnected from vCenter and the HA won’t function. Optionally, to reinforce your company’s security, you can prevent login directly to the host and check Enable lockdown mode. Users will be forced to login only through vCenter…. Finally, you can schedule the task. This might be useful in certain scenarios where you’re adding new hosts into the existing cluster where there are already some hosts. That is it. Last page of the assistant ask you about scheduling the task. Click the change > and select the Run this action now radio button. This assistant had seven pages. At any moment you can click on the right top corner, where are the two small black triangles. By clicking that it will interrupt the assistant and sends it with a cool animation to the Works in Progress window on the right hand side. You just added the host to your cluster. Do the same for the other host(s), knowing that minimum two hosts are necessary to form a HA cluster. By clicking the propriety of the cluster you can configure the Host Monitoring, enable Admission Control and also use VM monitoring. I’m going to return back to this article, and complete the explications for those options. This article does not mean to have all details about HA and clustering, and there are many books and websites which goes much deeper. For the sake of simplicity, this article is here to help people which are new to VMware, new to clustering, new to this terminology. vSphere 5.1 brought new vSphere Web client, and so the screenshosts done through the new vSphere Web client are different. The time necessary to configure vSphere cluster depends on many things, but it an be done quite fast when all prerequisites are met and all components and hosts are already installed and configured. TIP: VMware vSphere 6.5 – HA and DRS Improvements. What is VMware DRS (Distributed Resource Scheduler)? Hi Vladan, Thank you for this article. Do you know, if there is a way to disable the automatic fdm Agent deployment, which is carried out by vCenter Server. When installing a new vCenter, there is an option that can be set, although can this option be disabled afterwards? The moment you check the HA option (at the cluster level) it gets activated/deployed…. Hope this asks your question. Thanks Vladan for your quick response. I am planning a major upgrade of ESXi Hosts, which requires to have the vCenter upgraded first. When I disable HA in the specific Cluster, the fdm will not be upgraded before I use VUM to carry out the Major upgrade. That saves me one restart of the Hosts. I see. There is VUM. So basically as you just said, you should upgrade VC, then VUM and then ESXi hosts. The upgrade can be orchestrated in the VUM where you got a choice to evacuate VMs and putting hosts into maintenance mode, automatically. I am new for VMware VSphere, and started working from last 6 Months. Since i have not full control on environment i am not able to explore as i want. Thanks for your blogs these are very useful for me as i am started loving VMware. If you can give some idias about how to start learning and some beasic documents , It will be great for me. Can i configure HA on VMware is installed on 2 Server DELL? I think that you can configure HA with iSCSI or NFS. As for SAS, you might want to check with VMware. 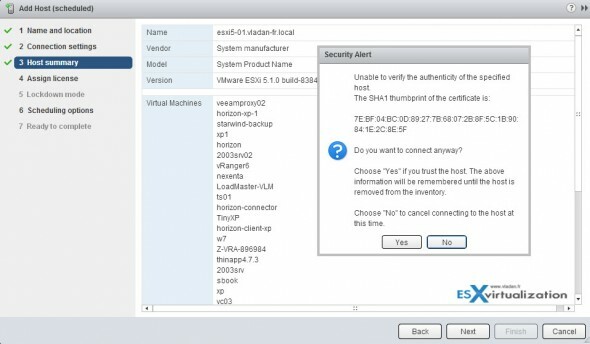 Can we create the vcenter cluster if the ESXi host is having different license. (3 host is having enterprise and 1 host is having Enterprise plus. As long as you have vCenter Standard (not essential) for managing those 4 hosts, you can. But you’ll lose a possibility to have the advanced features present in Ent. Plus. Q1:I want to upgrade a VM from windows 2008R2 to Windows 2012 R2, which is in VMware HA cluster. Q2: Also My Vcenter running in VM (Windows 2008R2) , I want to upgrade the same VM to 2012R2. Is there any best practice or proceedure for the above. Well, you should have 2 datastores for the hearbeat. Will your installation works like this? Probbably yes. But when you’ll create a second LUN and second datastore, you can just go back to the configuration and check the box for the second datastore, to be compliant. is there a way to automatically restart VM’s in HA cluster after an Power Failure? Or ist it really an unsupportet Feature in Vsphere HA? No, the way HA was designed is to deal with hardware failures, and as such, you could place the servers not on the same power socket, with the same Power supply. (to have double power supply). In this case the surviving host would be the one where those VMs are restarted. What do you use for DNS Resolving? Hi Bony, It was a simple lab setup with Windows Server and DNS role installed, altogether with a DC role. Hi Vladan, I have 2 servers DELL R740 and a DAS Storage MD1420. I can see both Esxi Hosts but with differents storage, I don’t know how to share the same datastore for the hosts. Could you help me? Or maybe you can show me a link explaining that? I purchased licenses VMware vSphere 6 Essentials Plus Kit for 3 hosts. Thanks!